We are commercial IT company providing web services for business since 1992. We at Megrisoft aim to deliver great quality work & desired results. Megrisoft is one stop shop for its clients to outsource all digital services at one point. Our twenty five years of hard work make a digital experience web company on the global stage. We aim to build more innovation, talent, growth, and success. We are strengthened by alliances with leading outsourcing partners partners in US, UK and Europe. We are Google and Microsoft partner for few product and services. 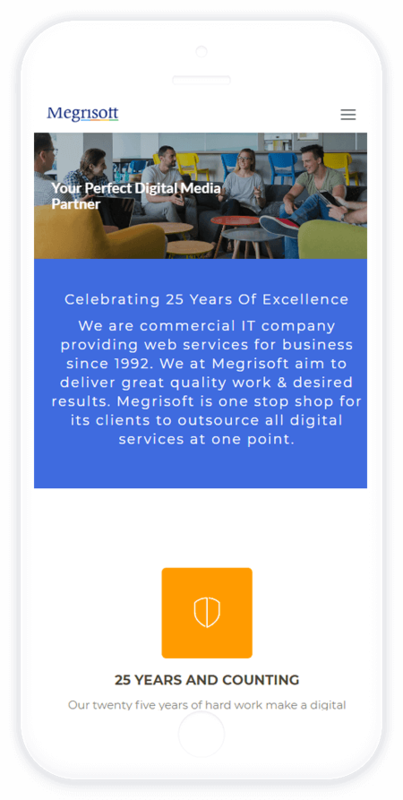 Megrisoft is headquartered in the India with 4 offices and International offices in London, United States and Canada with infrastructure of 200 work stations. Our services cover web design, development, mobile apps, hosting digital marketing, SEO, content , social media, consulting and outsourcing. Registered with NASSCOM® (National Association of Software and Services Companies), Confederation of Indian Industry (CII) and Software Technology Parks of India (STPI). Megri Soft Limited a profitable, public company with equity shares listed on BSE ( Bombay Stock Exchange) and Metropolitan Stock Exchange of India ( MSEI). Four offices across the globe. Experienced and skillful interns and graduates working for us. Dedicated teams of inspired people. This is what makes us what we are today. Accomplish your website requirements with customized website designing. Secured web development on WordPress, Drupal, Joomla, Magento, PHP, Opencart. Customized mobile app development to meet all your requirements. Here your ideas will be live. Distinguished strategies which results in best practices of Search Engine Optimization. Our experts write contents after intensive research and offer consequential information. Cost effective outsourcing partners. No data sharing with competitors is our assurance. From 27 years we have invested time and experience to sharpen our skills. Presenting you today with finest digital solutions with a mission of building stronger relationship, trust and growth.